Southern Arizona may get less attention that some of the more well-known gold mining districts in the central part of the state, but there are many areas in the Sonoran desert where gold can be found. There are lots of areas near Tucson where you can find gold with drywashers and metal detectors. Even some good-sized gold nuggets have been recovered in some areas near Tucson. So let’s take a look at a few area in Pima, Pinal, and Cochise County where gold has been mined in the past. Coarse placer gold was found in dissected bars and benches along Alder Canyon and tributary gulches from near the Coronado National Forest boundary to within a few miles of the San Pedro River. Placer gold has been found in most of the gravels that mantled the flanks of the Las Guijas Mountains and in many gulches that headed in the mountains. Most of the placer mining was concentrated on the northeast flank of the range, south of Las Guijas Creek; at this particular zone, mesa gravels between the edge of the mountains and the creek bed were notably gold-bearing. Gold placers occurred along the upper course of Armargosa Arroyo, which heads in the Tinaja Hills of southern Pima County, six miles west of Continental. For several years, a minor amount of drywashing has been done in the gravels of tributaries to this arroyo, in the southeast flank of the Sierrita Mountains. In the southern portion of the Baboquivari Mountains, most of the gold-quartz veins so far explored occurred near the foothill margin of a pediment along the eastern base of the range. The placers in the area were located at the eastern and western flanks of the Baboquivari Mountains. This is reached from State Highway 286 that paralleled the eastern flank of the Baboquivari Mountains, and west from the highway along service roads that lead about to the mining areas. Placer gold was found southeast of Baboquivari Peak at the eastern foot of the mountains. The gold-bearing gravels were found in benches and bars along a large east-trending Placeritos Wash and Shaffer Wash.
Several lode deposit mines operated in the Greaterville area, including the Yuba or Inghram, the St. Louis, and the Quebec. These mines had free-milling gold, with the Yuba producing wire gold specimens. The placers in the Greaterville district were found forty-five miles southeast of Tucson on the east slope of the Santa Rita Mountains in streams that drained easterly, from the Melendrez Pass area in the Santa Rita Range to the Cienega Valley. Placers were found not only in the gulch gravels, but also in gravels on the hillsides and upper ridges between gulches. This deposit became the most sought-after placer deposit in Southern Arizona during the 1880s. Gold recovered ranged in size from flakes to large nuggets. Try using metal detectors to find gold nuggets. The Mammon Mine near the western side of the Slate Mountains is about 30 miles from Casa Grande. It has yielded a little high-grade ore. The Casa Grande district included the Silver Reef in southwestern Pinal County, where free gold has been found in veins at the Mammon Mine, and probably, occurred in other parts of the range. Placer gold occurs in the alluvial valley on the east side of the Slate Mountains. Small amounts of placer gold have been recovered from deposits in the northwestern part of the Superstition Mountains. The gold was probably derived from free gold in oxidized quartz veins in granite, which were mined at the Mormon Stope of the Young Mine. Placers in the Old Hat district were located in the northwest and northeast flanks of the Santa Catalina Mountains. The Canada del Oro placer area was the large alluvial fan at the northwest end of the Santa Catalina Mountains. The gold-bearing gravel occurred over a wide strip along the creek and in adjacent hillsides and extended south into Pima County. A small amount of placer gold was recovered in 1888 from Mineral Creek on the western flank of the Dripping Spring Mountains in the eastern part of Pinal County. The Pioneer district, in northeastern Pinal County, in the vicinity of Superior, has been noted mainly for the Magma Copper Mine and the old Silver King Mine. Prior to 1932, this district yielded approximately $2,056,000 worth of gold, most of which was a byproduct of copper mining. Placer gold was recovered from the southwestern part of the Pioneer district in the vicinity of Picket Post Mountain. The probable source of the gold was eroded material derived from oxidized veins in the area. Located southeast of Wilcox in the Dos Cabezas Mountains, the Dos Cabezas district had many copper, lead, silver mines with a byproduct of gold. Placer gold deposits in flat, ragged, rather coarse shapes occur in the vicinity of Dos Cabezas; in upper Gold Gulch, northwest of Dos Cabezas; in the Teviston district, at the northern end of the range; in the vicinity of Apache pass, at the southeastern end of the range; and, all area arroyos and gulches, benches and terraces. The placers on the north flank of the foothills of the Dos Cabezas Mountains were found in the mountain gulches and on pediments at the edge of the mountains, where gold was found in nuggets that were often very coarse. East of Tucson, and about twenty miles northwest of Bisbee was the Tombstone district, located at the Tombstone Hills in southwestern Cochise County. The area has been primarily noted for rich silver deposits that were most actively worked between 1877 and 1932. It had produced approximately 271,000 ounces of gold as a byproduct of silver mining. Fourteen miles east of Tombstone was the Turquoise district, on the eastern side of the Dragoon Mountains, which is 18 miles north of Bisbee. There were numerous mines, with gold distributed finely in slope gravels. The area had a total production of 70,000 ounces during the first half of the 20th century. 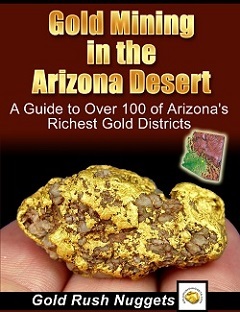 Arizona is most definitely one of the best states in the country to prospect for gold and other rare minerals. It seems that every part of the state has gold deposits, and the southern Arizona desert surrounding Tucson is no exception. There are two major challenges that gold prospectors face in this area; extremely hot weather and dry conditions. A total lack of water in most areas prevented the use of standard placer mining methods by the old-timers, and also has limited the total gold production in the area. Using a metal detector is one of the best ways to find gold around Tucson. Search around the existing gold-bearing areas and see what you find. There have been some nice gold nuggets found over the years.